← What the Heck is a Twitter #Hashtag? And a Handy #Hashtag Cheat Sheet. 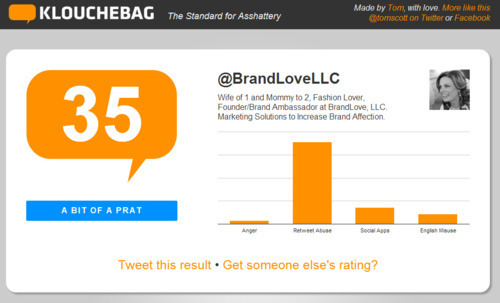 Klouchebag–A Brilliant Parody of Klout. What’s Your Klouchebag Score? If you’re frustrated with Klout and agonizing over your Klout score, you’re going to love this brilliant parody version of Klout developed by Tom Scott called Klouchebag—the standard for measuring asshattery online! I do love the Brits and their humor. Klouchebag was created because Tom got annoyed with the fuss around Klout and he called it, “the horrible social-game that assigns you a score based on how “influential” you are online. This is the result of that frustration. BTW: Tom’s looking for work doing web, video and viral stuff. Somebody needs to grab this guy before’s he’s too busy for new work and gets really expensive. Here’s my Klouchebag score. Cheers!